In case you want familiarize how 3G, GPRS and MMS settings work on your Nokia 5530, 5800, 5230 S60V5 mobile phone, you may try exploring its manual configuration by following the guide below. Manual configuration also is an option for you in setting your access point in case you are unable to receive the pre configured networking settings from your provider. Tweaking manual configuration may help you familiarize on setting proxy address and port on your desired access point connection. See below guide on how to do the manual configuration for Globe, SMart and Sun on your S60V5 (5530, 5800, 5230, X6, X3, C6 etc). A po up will appear "Automatically check for available access points?" On Connection name: you may leave it as is myGlobeConnect, or you may change on your desired new name. Leave 'Network type' to 'IPv4'. Leave 'Phone IP address' and 'DNS address' to 'Automatic'. From there you can 'Edit', 'Organise', Rename your manually created access point. The process is almost the same but you need to change the correct details on your network MMS configuration details. 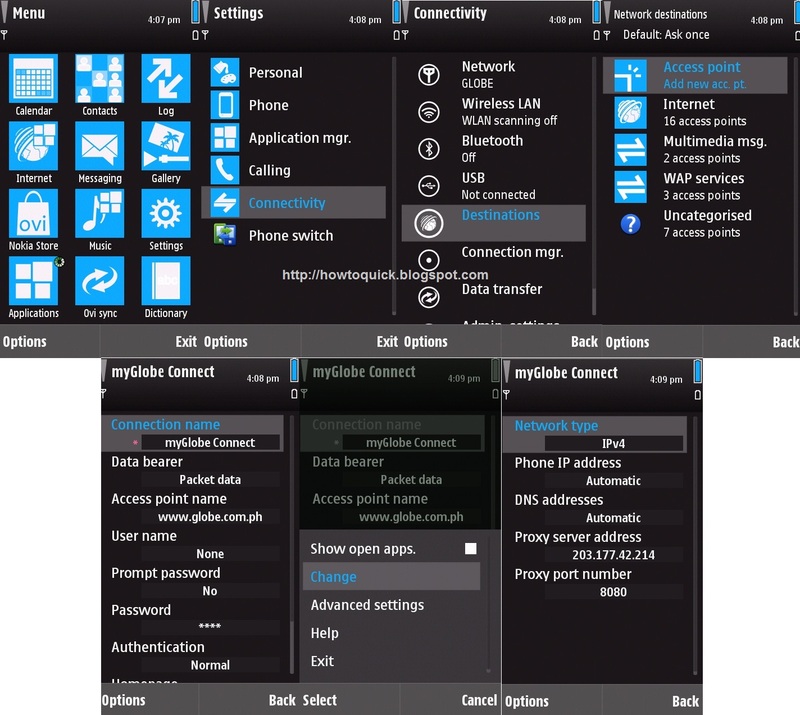 On Connection name: you may leave it as is myGlobeMMS, or you may change on your desired new name. From there you can 'Edit', 'Organise', Rename your manually created access point. That's it you're done with manual MMS settings.